Eleanor Davis’ cartoon collection How to be Happy, reviewed. A bright cartooning talent gets her first book of short stories, and it’s beautiful and surprising. 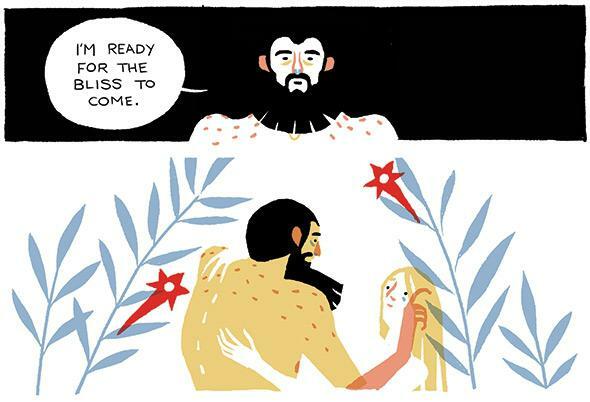 For years, Eleanor Davis has been creating short comics stories for Nobrow, Lucky Peach, and her own site. I’ve always loved her unique sense of color and her embrace of elliptical storytelling—the care and craft that clearly go into stories that don’t shy away from ambiguity. Fantagraphics is publishing Davis’ first collection of stories, How to Be Happy, in August, and it’s an inspired and inspiring collection of short work clearly establishing Davis as a leading cartoonist of the Tumblr era. A mix of evocative, geometric watercolors and fluid pen-and-ink cartoons, How to Be Happy tells stories of sad people, lonely people, strong people, confident people, all trying to find a tiny bit of happiness in life. A 15-year-old with a crush next door; a back-to-nature communitarian for whom nothing is good enough; an artist in an environmentally ravaged future; a boatsman with curious passengers: All look to tell themselves stories that make sense of the worlds where they live. Davis’ clever and sometimes jaw-droppingly beautiful artwork makes those stories feel real. I’m very proud to have Eleanor Davis illustrating the July issue of the Slate Book Review. How to Be Happy by Eleanor Davis. Fantagraphics Books.